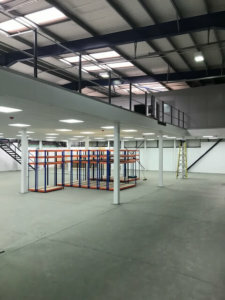 We are specialists in providing mezzanine floors to industrial locations. A mezzanine is an intermediate floor (or floors) in a building which is open to the floor below. It is placed halfway up the wall on a floor which has a ceiling at least twice as high as a floor with minimum height. A mezzanine does not count as one of the floors in a building, but does the job as any other floor so effectively can almost double your floor space! Mezzanines help to make a high-ceilinged space feel more personal and less vast, and can create additional floor space. Mezzanines, however, may have lower-than-normal ceilings due to their location. In industrial settings, mezzanines may be installed (rather than built as part of the structure) in high-ceilinged spaces such as warehouses. These semi-permanent structures are usually free-standing, can be dismantled and relocated, and are sold commercially. Industrial mezzanine structures can be supported by structural steel columns and elements, or by racks or shelves. Depending on the span and the run of the mezzanine, different materials may be used for the mezzanine’s deck. Some industrial mezzanines may also include enclosed, panelled office space on their upper levels.? Mezzanine floors can be used for a number of purposes. We have installed mezz?s in gyms to increase their floor space for customers, we have installed in warehouses so companies can have their offices on one floor and use the full warehouse for storage and we have installed mezz?s in shops so they can show off more stock to customers! They really can be used for a whole range of purposes? and we really have seen it all! 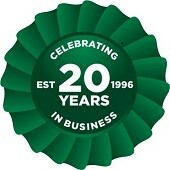 We are always looking to buy new stock! If you are selling a mezzanine floor please don?t hesitate to give us a call on 0800 345 7088?or please send us a photo with pictures to sales@advanced-handling.co.uk and we will supply you with a FREE valuation!